Bali Surfing Pro Surf is located in front of Kuta Beach. They offer detailed lesson depend on your level and passionate instructors. Their office is located in front of Kuta Beach, so you can use their facilities after surfing lesson. After 2nd day, the lesson program will be changed depend on your level. It is recommedned school who seek level up. Pro Surf is located in front of Kuta Beach. They offer detailed lesson depend on your level and passionate instructors. There are wide range of courses from 2 - 10 days, and you can choose your favorite schedule. They have complete facilities such as pool and lounge, etc. School schedules are 6 courses, 2 days, 3 days, 4 days, 5 days, 7 days and 10 days. You can seek level up increasing lesson days! There are Beginners - Intermediate 1, 2, 3 Level, so after you go there and meet with an instructor, you can choose the level depend on your experience. It is suitable for students who have some experience and able to catch small waves. The course forcus on effective board control, paddle out, choosing wave, principles of timing and take off, and basic front and backside turns. 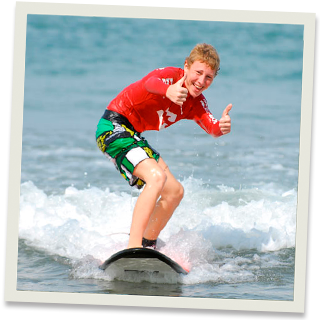 It is suitable for experienced surfers who want to reef surf and more developing skills. Understand the surf zone & reef environment, entru point, exit point, current flow, and reading waves. - After Day 2 lesson, schedule and lesson program is changed depend on your level. There are no Private and Semi Private Lesson. All programs are Group Lesson. Usually, lesson is provided by English speaking instructor. If you want to request other language speaking instructor, please let us know. *1 You need to put deposit money Rp.200,000 for in case lost key. The deposit money will return when you return locker key. *Start time will be changed everyday depend on tide condition. Please check Lesson Schedule. My boyfriend like surfing….and on this chance I also want to try to surf in Bali. 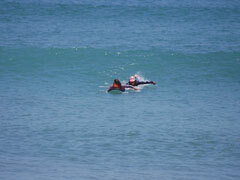 It was the first time for me to go to surf school. The lesson is conducted by Japanese speaking instructors, and I took lesson according to my level.